...... 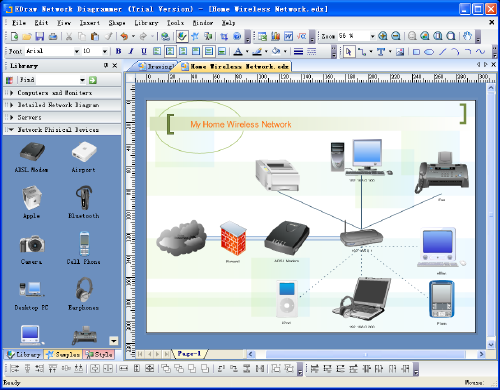 Logical network diagram symbols, physical network devices, vertical view network diagrams and Cisco network diagram icons. * Include thousands of ready-made graphics and templates for computers, servers, hubs, switches, printers, mainframes, routers, cables, fax and more. * A bundle of network diagram examples and templates. Network drawing does not need to start a new. Just drag the ready-made network symbols from the libraries and drop them on your page. Network drawing couldn't be easier! * You don't need to be an artist to create great-looking results! Edraw helps you align and arrange everything perfectly. * Common graphic format support and printing what your see is what you get. * What you see is what you get. Zooming, scrolling, multi selection and multi-level undo/redo supported. No network drawing artistic skill is required. Automatically aligns and arranges everything to let your network drawing look great. Create illustrations, documents, flow diagrams, org charts easily! Qweas is providing links to Edraw Network Diagrammer 6.3.2 as a courtesy, and makes no representations regarding Edraw Network Diagrammer or any other applications or any information related thereto. Any questions, complaints or claims regarding this application Edraw Network Diagrammer 6.3.2 must be directed to the appropriate software vendor. You may click the publisher link of Edraw Network Diagrammer on the top of this page to get more details about the vendor.